The title of this book says it all. “Happy R.A.V.I.N.G. Customers!” (MCH Press, 2014) is 200 pages packed full of strategic, tactical, and practical inspiration. If you’re looking for a book that glosses over the real meat of the subject, look elsewhere. 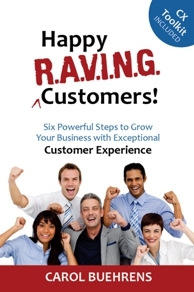 However, if you want a comprehensive guide to start and grow the discipline of Customer Experience at your organization, “Happy R.A.V.I.N.G. Customers!” is for you. In “Happy R.A.V.I.N.G. Customers!”, the business leadership book authored by Carol Buehrens, you’re walked through a six-step process that’s key to differentiating your company’s brand. To remain profitable in business today, you need more than merely satisfied customers – you want customers who love you and RAVE about your company. Having RAVING Customers is a powerful concept. They act as your marketing agents, impacting your brand charisma and positively directing new customers your way. By following the practical steps provided by Buehrens in “Happy R.A.V.I.N.G. Customers!”, you’ll learn how to refocus your strategy, goals, and your employee culture on what counts, your customers. You’ll also be provided a wealth of tools and templates, from interviewing techniques to journey mapping, to employee rewards and motivational posters, which you can put to use immediately. Don’t let your customers become “out-of-scope” where employees and projects are concerned. Help move your culture from being process-driven to customer-driven by following the ideas and techniques in “Happy R.A.V.I.N.G. Customers!”. Interesting in BULK orders for your company? Contact MCH PRESS — they’ll be happy to accommodate.